Windows 10 doesn’t support RAW file support out of the box, but if you still need a RAW image viewer in Windows 10, then here is the guide for you. Nowadays, most of the DSLR and Mirrorless camera comes with RAW image support. If you are a beginner photographer, then it’s ideal to shoot your photos in RAW format. But, if you don’t know about this file format, then let me explain you. What exactly are RAW images? RAW is just a file format like other image files such as JPEG. But, the main thing is, it is a type of uncompressed image file that’s more like a digital negative. When you shoot in standard photo file format, your camera compresses all the details like white balance, contrast, saturation, etc. into a smaller file. A RAW photo contains all these details, that’s why it is huge in size, and you can change these editing values later with a photo editor like Photoshop. If you are a beginner, these photos can help you to change the values and make an attractive image. Why You need RAW Files Viewer in Windows 10? You need Photoshop CC to open RAW images you have captured in your camera. The earlier version of Photoshop needs an extra plugin to view them. Sometimes you capture many photos of a single object, and you can’t open all the files in Photoshop for editing. If there is a way to view RAW files in Windows 10 before editing, then it could save a lot of time. You can check the preview of every image you captured and choose the desired once which you want to edit. Now, you don’t need to install heavy third-party software in order to preview Raw files in Windows 10. Remember that, all Windows 10 versions released before the version 1903 don’t support RAW images out of the box. If you have the version 1903 or 19H1, then you can install a small extension from the store to open these files. 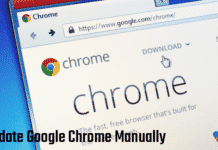 Once you install the extension, you will be able to open RAW images in Windows 10 and can see the thumbnails in the File Explorer just like the other image file formats. The extension supports must of the popular Raw extensions except .CR3, and .GPR. Note: This extension is in Beta stage. Before installing the Raw Image Extension (Beta), make sure that your system is running on the version 1903 (build 18323) or above of Windows 10. Otherwise, it’ll not work for you. 1. 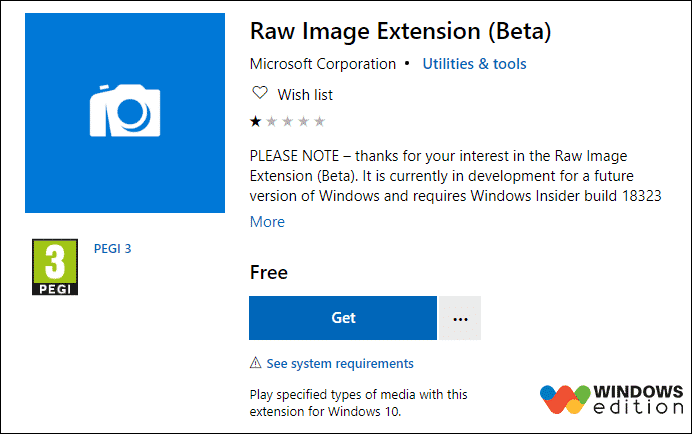 Visit the official link of Raw Image Extension (Beta) in the Microsoft Store. 2. Click the Get button to install it on your computer. That’s it. 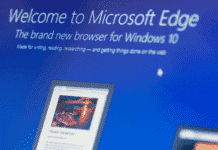 This is how you can open RAW image files in Windows 10. From now, you’ll be able to preview the thumbnails in the File Explorer and view them in the default Photo app. 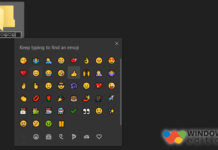 In case you are using other image viewer programs that use the Windows Image Component framework, then you can also use them to view your Raw files. After installing the extension, if you are not able to see the thumbnails of your RAW files, then restart your PC once. That’s it. If you like this guide, then don’t forget to share with your friends. © 2018 WindowsEdition - All Rights Reserved.